The best part of January is the prospect of Springtime just around the corner. I'm looking forward to Spring more than ever this year as Alabama is in the midst of its first "real" winter in years with record low temperatures. When it's 12 degrees outside (I know many of you are dealing with much colder and brutal conditions, but you have to remember, I'm in southern Alabama) it's easy to daydream about barefoot walks in clover, bird watching as nests are built and eggs laid, warm sun on my face, and the trees filling with foliage once again. Okay, back to the present. I'm excited about my new membership in The Bread Bakers' Guild of America (www.bbga.org). I've decided that 2014 will be the year to hone my bread baking skills and I get to start as Peter Reinhart's (The Bread Baker's Apprentice) assistant during a workshop put on by The Guild in Atlanta on March 1. Featuring baking with sprouted and ancient grains, I'm sure to pick up great tips and recipes from the experts to pass along to you. I'll also be working with recipes from my vast collection to adapt as many as I can for great baking with sprouted flours. Can't wait to share them. I'm a real foods proponent, but egg replacers and plain tofu are good replacements for eggs in baked goods, custards and quiches. In desserts and sweet baked goods substitute 1/2 banana or 1/4 cup applesauce for each egg called for. Since they add distinct flavor, make sure they're compatible with other ingredients in your recipe. Great raw breakfast to grab and go in the morning. Spoon evenly into 6 pint canning jars. Cover with lids and screw on bands. Shake until well-combined (about 30 seconds). Chill 8-12 hours. Top each serving with additional fruit and drizzle with honey. 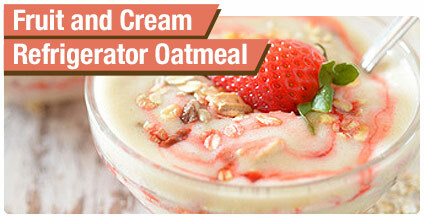 Creamy and soothing, yet light and refreshing. Bring first 4 ingredients to a simmer in a large saucepan over medium-high heat, stirring occasionally. Reduce heat to medium-low; simmer, stirring often, 20-25 minutes or until milk is reduced by half and rice is very tender. Whisk together cream and eggs. Whisk 2 tablespoons hot rice mixture into cream mixture. 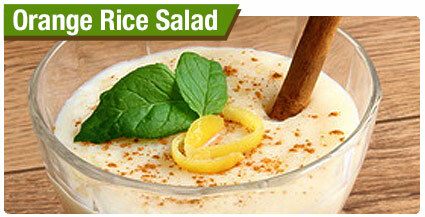 Reduce heat to low; stir cream mixture into remaining rice mixture. Cook, stirring constantly, 2 minutes or until mixture begins to thicken. Remove from heat. Stir in pineapple and next 3 ingredients. Serve hot or cold with desired toppings. Topping Suggestions: navel orange segments, pineapple, toasted coconut, whipped cream, honey and cinnamon. Makes 5 cups. Use 1 1/4 cups of this soup in place of each can called for in your recipe. Melt 3 tablespoons butter in a Dutch oven over medium-high heat. Add mushrooms and saute 10-12 minutes or until liquid evaporates. Transfer to a large bowl. Reduce heat to medium. Melt remaining 5 tablespoons of butter in Dutch oven. Whisk in flour until smooth. whisk for 1 minute. Gradually whisk in cream and next 2 ingredients. Cook, whisking constantly, 2 minutes or until melted and smooth. Remove from heat and stir in mushrooms. Use immediately or cool completely. Can be frozen in zip lock bags for future use. 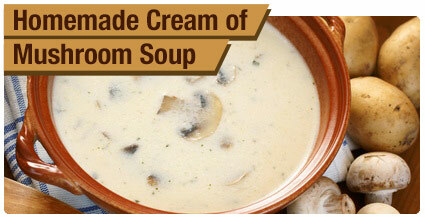 Use 1 1/4 cup portions when freezing to replace a can of mushroom soup called for in recipes. This recipe is great using gluten or gluten-free flours. When I started my business I sold hundreds of these loaves weekly at area farmers' markets. Mix flour and buttermilk into a batter in a large bowl. Thoroughly blend in remaining ingredients. If you end up with a dough instead of batter, add additional buttermilk one tablespoon at a time until you have a nice, thick batter (not nearly as thin as pancake batter). Pour into a well-buttered and floured 9x5 and smaller loaf pan (I always doubled the recipe which makes 3 9x5 loaves of bread, so you will have extra batter for a smaller loaf pan or a few muffins if making a single recipe). 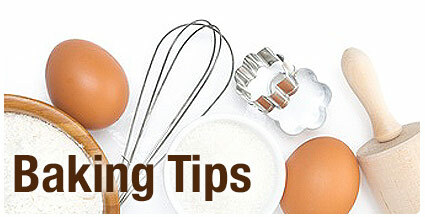 Bake at 325° for 1 hour and 30-45 minutes or until a toothpick inserted in the middle comes out clean. Cool slightly and remove from loaf pan. Cool completely on a wire rack. Great for slicing and toasting. Apricot Almond - add 1 tablespoon almond extract, 1 teaspoon vanilla extract, 1/2 teaspoon apricot oil (optional), 1/2 cup chopped organic, unsulfured apricots. Sprinkle top of loaf with sliced almonds before baking. Cinnamon Raisin - add 2 heaping tablespoons ground cinnamon, 1 tablespoon vanilla extract, 1 teaspoon cinnamon oil (optional), and 1 cup organic raisins. 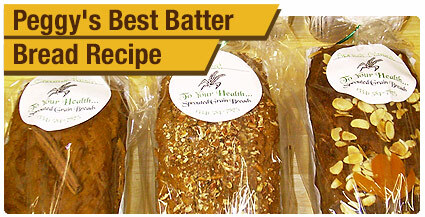 Rosemary Walnut - add 1 1/2 teaspoons ground organic rosemary, 1 1/2 teaspoons whole rosemary, 1/2 teaspoon ground sage. Sprinkle top of loaf with 1/2 cup chopped walnuts before baking. Herb Loaf - add 1 1/2 teaspoons organic dill, 1 teaspoon organic tarragon, 1/2 teaspoon each organic oregano, basil, and thyme. Use any of these as 100% of flour in recipe, or 50/50 - red or white wheat, spelt, barley, kamut, emmer, brown rice, sorghum, millet, oat. Other flours as not more than 20% total flour: amaranth, buckwheat, rye. Other flours as not more than 10% total flour: quinoa, lentil, garbanzo bean. If you choose to bake with sprouted Einkorn flour increase to 3 3/4 cup flour and follow rest of recipe.